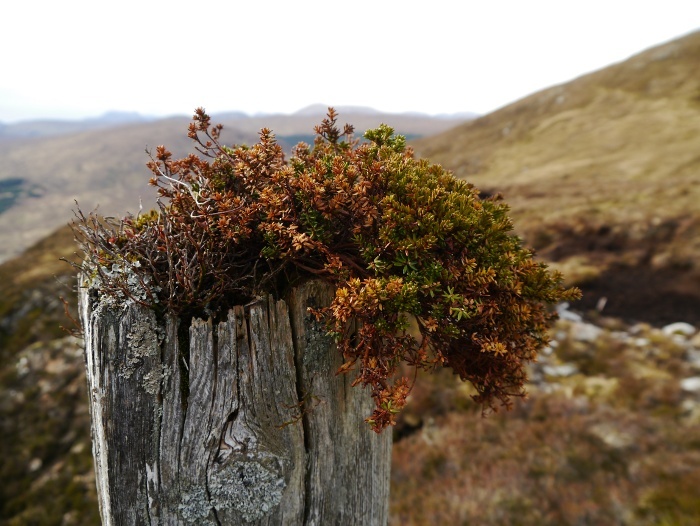 An Sidhean and Bac an Eich – a Corbett too far? On the journey up to Scotland I kept checking the weather forecast on my phone for the week ahead. I was pleased to see that our first day in Strathconon was meant to be calm and sunny, before unsettled conditions took over for the rest of the week. With body and mind brimming with enthusiasm I decided on a big day on the hills. 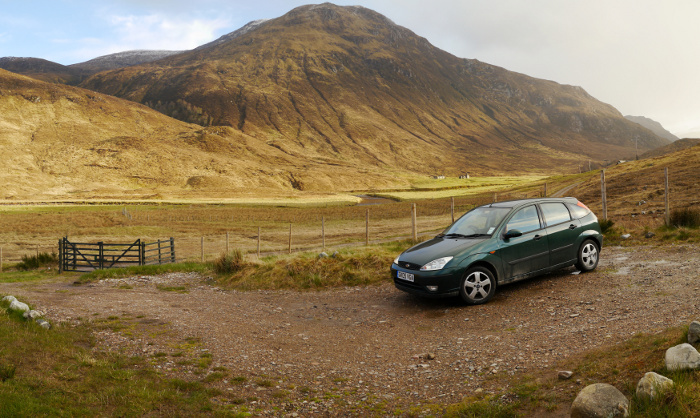 My planned destination was An Sidhean, a remote Corbett above Loch Monar. I was up at 7.00am, very early for me to be honest especially seeing that I was on holiday. Opening the curtains I was pleased to see that there was not a single cloud in the sky and a slight frost on the grass. I was out of the door by 8.00am, the still air already feeling pleasantly warm. I have to say that I enjoyed the novelty of setting off with a daypack from somewhere so remote and without having to jump in a car. I headed right at the bottom of the drive, in the direction of the West coast, many miles away across the mountains. The cottage of Corrievuic looked inviting and slightly ramshackled. Each time I passed by I thought about who owned it as it would make a splendid retreat in the hills. 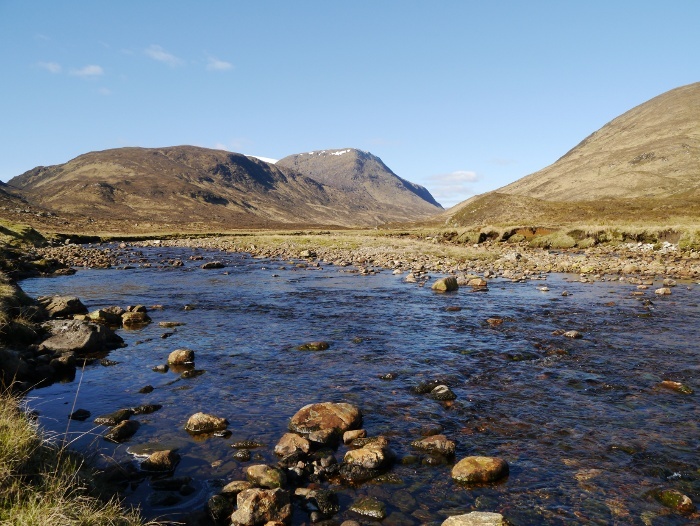 Once across the Allt coir a Bhuic the track climbed away from the River Meig and crossed an area of glacial remains. 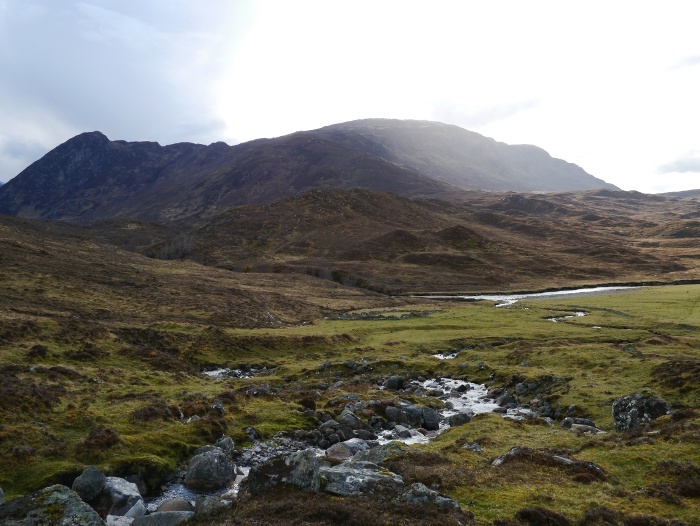 The river was rejoined higher up, the glen being stunningly beautiful. Huge swathes of close-cropped grass provided many spots that looked inviting for a wild camp, the river providing pools suitable for a dip. The track soon petered out and became a path which passed between rough bog and heather and further patches of perfect turf. 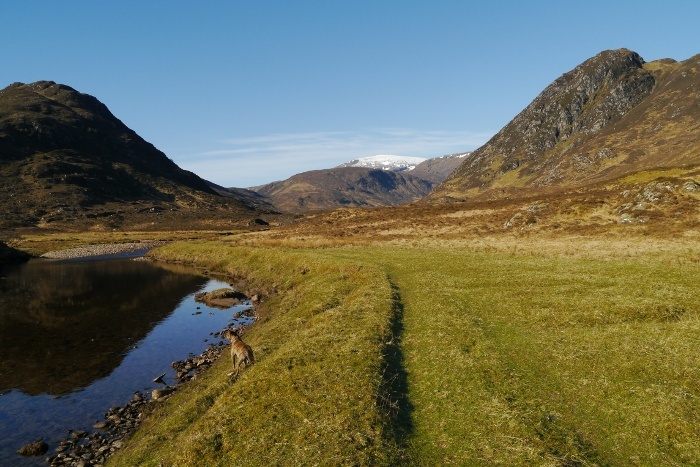 I enjoyed the stillness of the glen and could not believe how good the weather was. I crossed the River Meig lower than originally planned at a point where it widened out. The water level was low and I hopped across from rock to rock, finally getting to the other side without letting water into my boots. Reuben who is now fully proficient at river crossings simply splashed his way across without a care in the world. A large boulder on the other side provided a convenient spot to start my flask of coffee. Reuben jumped up to join me and we both leant against each other in the sun. It was then that I noticed an unwelcome visitor crawling up my trouser leg. It was a rather large deer tick, which as soon as I managed to get a photo was evicted back onto the ground. 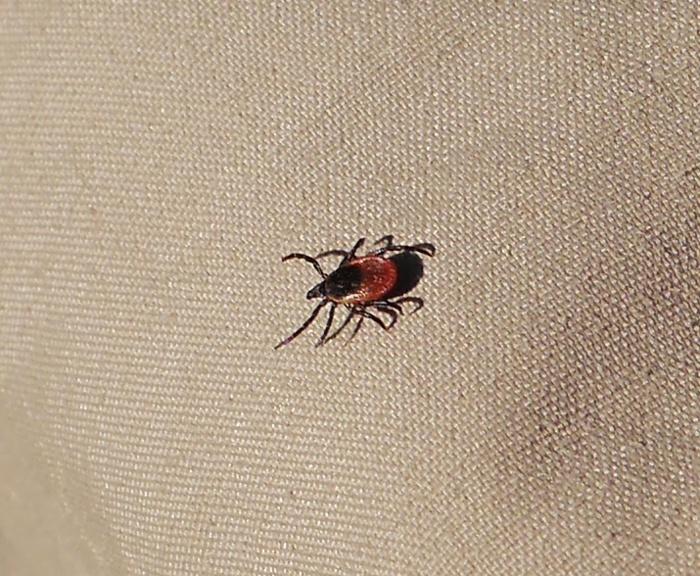 Ticks are the nemesis of Backpackingbongos and I appear to attract the little devils in large numbers. The evening before as I walked behind the cottage I attracted about 10 on my trousers within a few yards of going off piste up the hill. Thankfully though as far as I am aware none got attached during the week in the Highlands. I highly recommend wearing light coloured clothing as it is easy to spot and flick them off, anyone wearing shorts are inviting trouble. Reuben only had one which I put down to using Frontline on him before leaving home. Tick aside it was an excellent spot to sit and pick fluff out of my navel. We crossed a few hundred metres of rough ground to pick up the path that ascends alongside the Allt an Amise. After a short climb the steep-sided valley soon enclosed us and the path crossed the stream several times as they both fought for space. 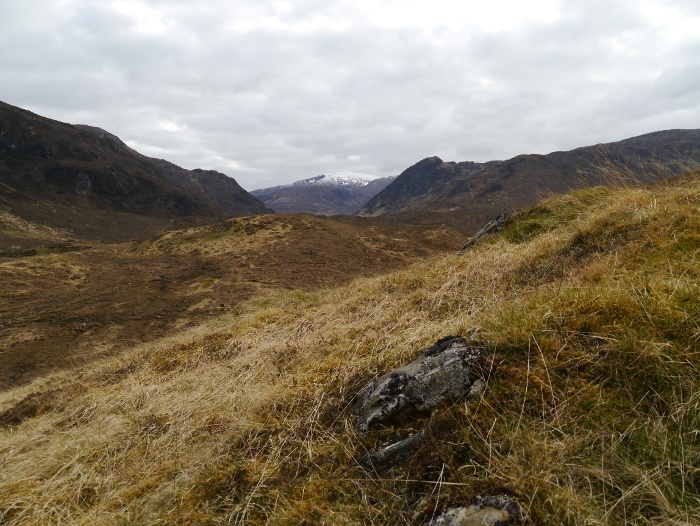 At the watershed we followed a narrow path to the east, a good view of Maoile Lunndaidh opening up behind us. The path was difficult to follow as it snaked its way up the hillside, vegetation covering its zig zags. It became a bit of a game as I tried to work out where it was going when it disappeared. I felt pleased with myself whenever I relocated it further up the hillside, guessing the route of its original creators. 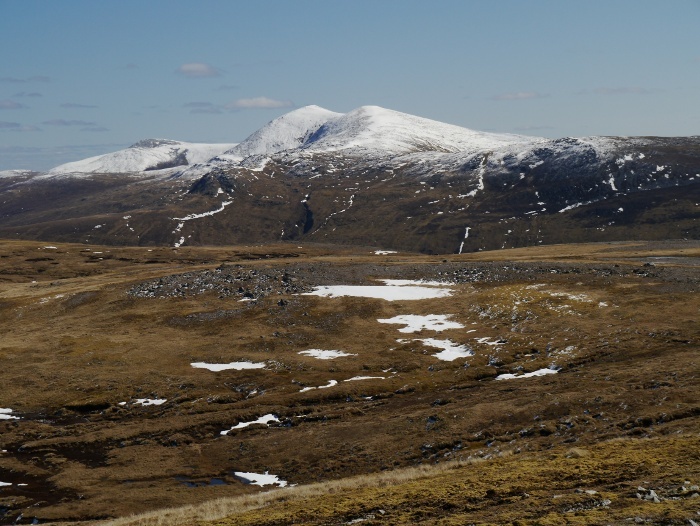 As we gained height the views to the north opened up, the Fannichs standing proud and snow-capped against the horizon. 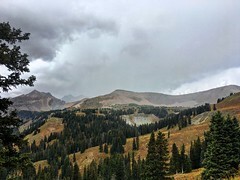 I have to admit that my unfit legs and lungs started to feel the climb and I began my technique of walking a few paces before stopping to stare at the view. 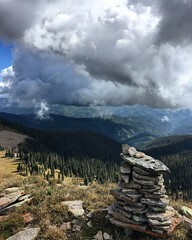 I came up over a small ridge and my jaw dropped to my knees, the view in front of me was breathtaking. 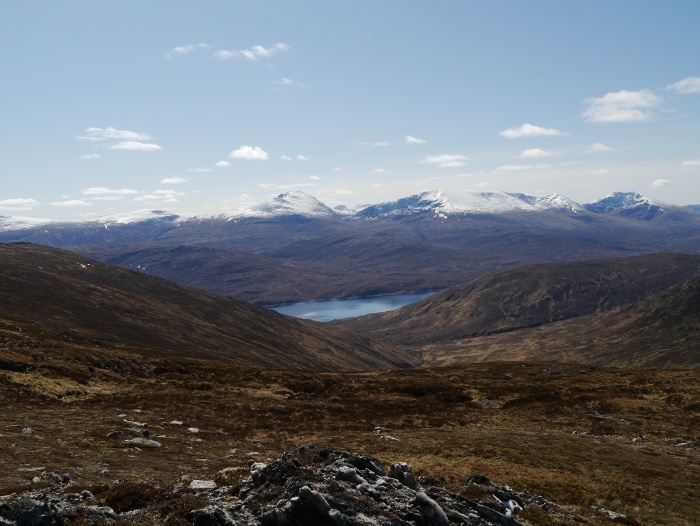 An array of snowy peaks spread into the distance, floating on a sea of brown above Loch Monar, the sky a deep blue. 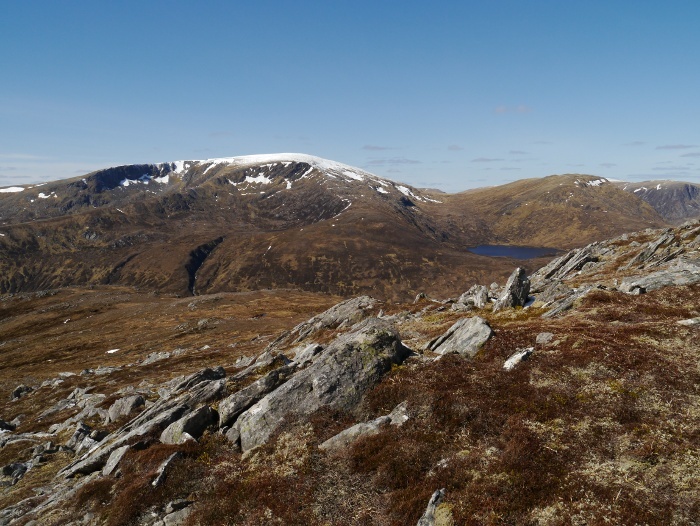 The Mullardoch hills looked like impressive beasts, I’m keen to do a high level backpack there. It’s just a shame that the strong sunlight made it difficult to capture the vast dramatic emptiness of the landscape. 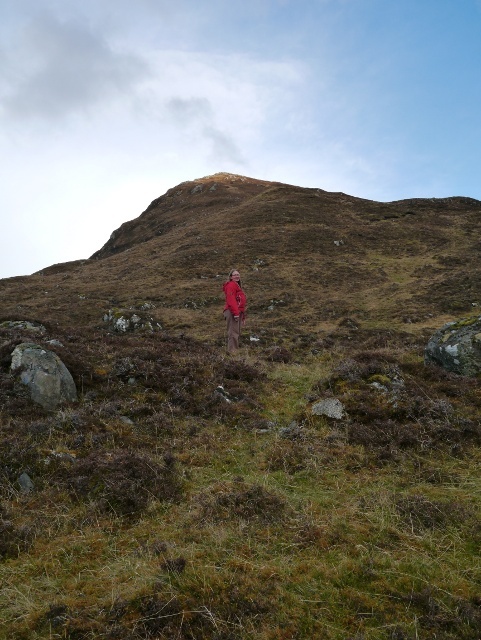 I continued climbing, grinning from ear to ear, my wobbly legs finding renewed energy. 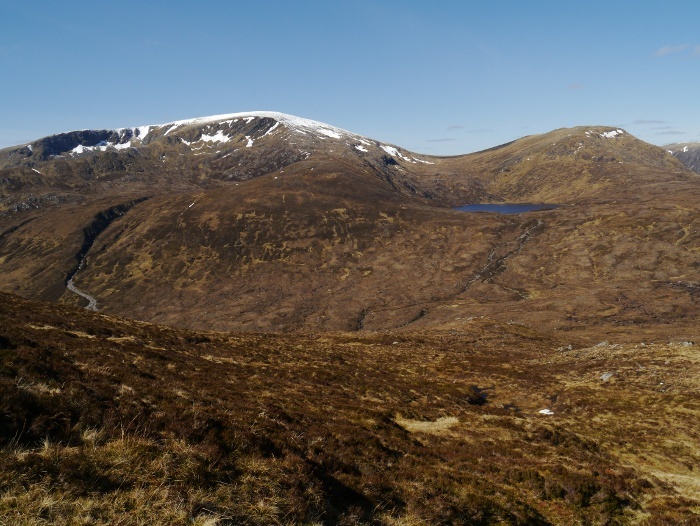 I did keep on stopping to look back at Maoile Lunndaidh, its numerous corries looking like the earth had been removed by a giant ice cream scoop. 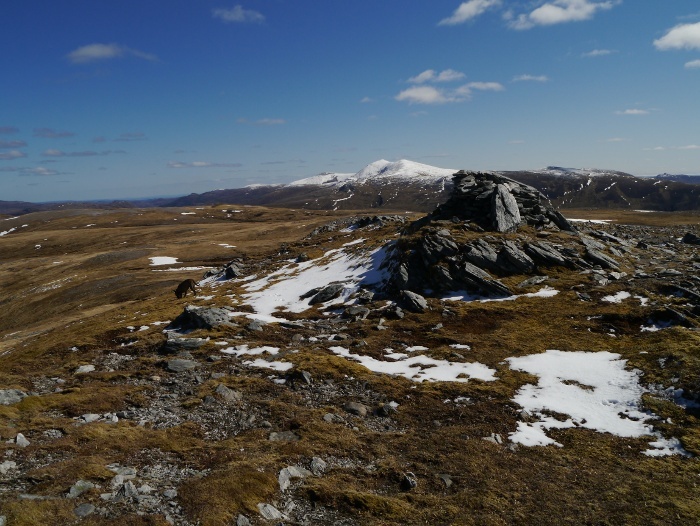 At the summit cairn it felt like spring had been firmly left down in the glens as a cold wind tugged at my Paramo. 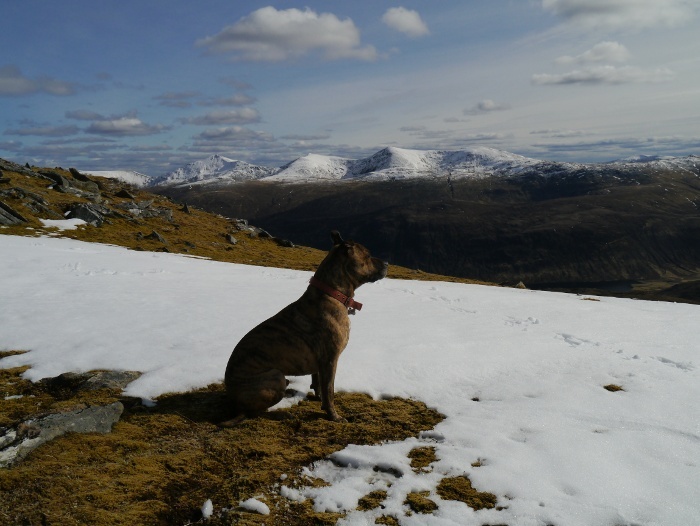 The snow-clad Strathfarrar hills rose above the huge wild gash of Glen Orrin. 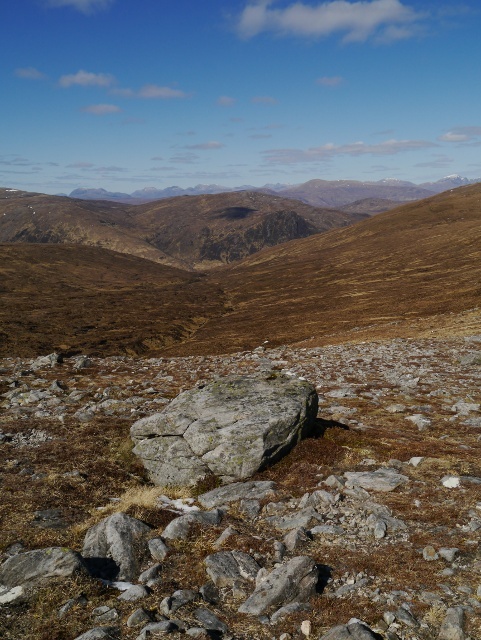 I stood at the summit cairn for a while, slowly turning to take in the huge panorama, mans influence on these wild hills invisible from where I stood. Then my eye glimpsed movement far to the east, the highest turbines of the Fairburn wind farm quickly destroying my illusion of wildness. I cursed and ambled off to find a sheltered spot to enjoy coffee and sandwiches in the sun. 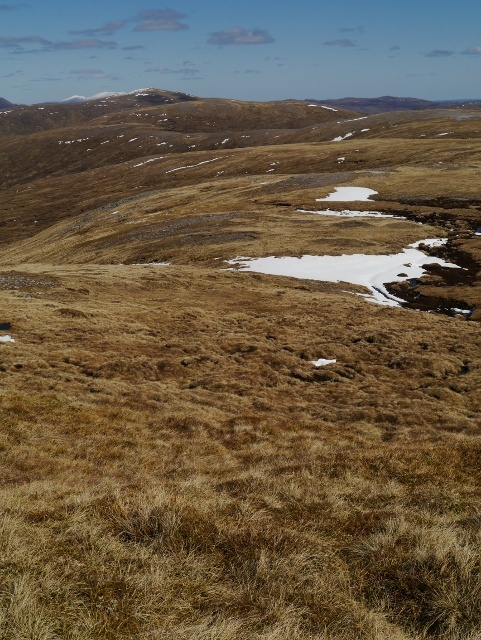 An Sidhean sits on a large upland plateau and I needed to cross high featureless ground for a few miles. This is amongst my favourite type of walking, a sense of spaciousness and gentle contours. A place where you can stride with hands in pockets across tundra like vegetation. Perfect for clear sunny days but a nightmare test of navigation when the clouds blanket the hills. The going was easy and I did my best to follow the contours rather than climb them. Mountain lassitude crept in at one stage when I spotted a deep dry bed of grass sheltered from the wind. Both myself and Reuben lay there for a while. The views down the Allt na Feithe Riabhaich caught my eye with open country appearing to zig zag off into the far distance. 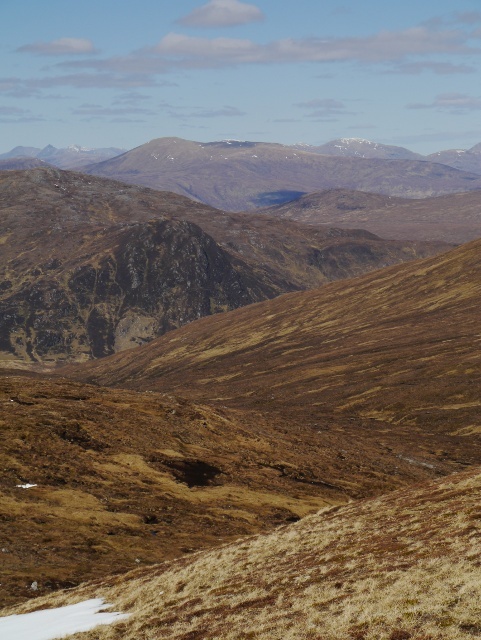 The air clarity was stunning with what appeared to be most of the North West Highlands at my feet. Further along the plateau my contour avoiding technique failed as I attempted to not climb the 80 metres over Sgurr Coire nan Eun. Instead we skirted to the north and were soon caught up in a series of peat hags which ran across my chosen route. I lurched and cursed across the rough boggy ground which Reuben bounded across with canine ease. 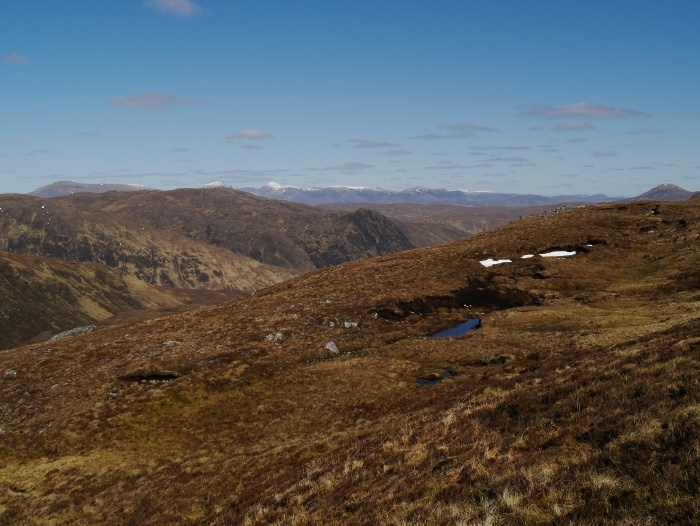 Thankfully where the ground steepened on its final descent to Drochaid Coire Mhadaidh I spotted a stalkers paths zig zagging down the hillside. Unfortunately whilst trying to reach it I slipped in a vertical bog and was caked in slime from head to toe on my left side. Thankfully no damage was done though. At the col I had to make a decision. 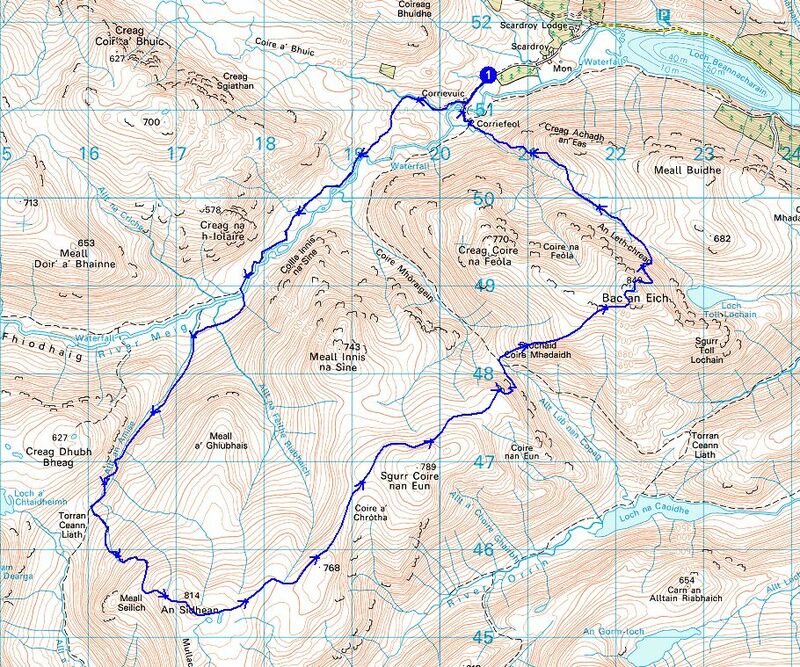 Would I return directly back to the cottage via a good stalkers track or continue on over the Corbett of Bac an Eich? Seeing that I was already high in the hills and the weather was so good I decided that the extra 300 metre climb would be worth it. Ten minutes later and with less than 100 metres climbed I found myself sprawled in an exhausted heap on the ground. I was in a situation where my brain was keener than my body. I was well and truly knackered! However it was not too bad a place to sit and admire the view. 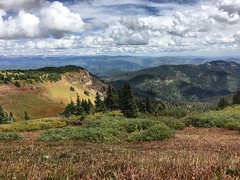 With energy slightly restored we slowly made our way to the summit, the soft snow patches becoming larger with altitude. At the top it was cold and windy and I wedged myself in the summit shelter whilst I refueled my tired body with sugary snacks. The views were once again extensive and I wished that I had a larger scale map to identify the array of peaks filling the horizon. Although Ben Wyvis was easy to spot as it dominates this part of the Highlands. I did consider descending via the well-defined north-west ridge but I knew that I would then have to cross a steep gorge lower down. Instead we took a direct line down very steep slopes to the north, seeking out the easiest ground. 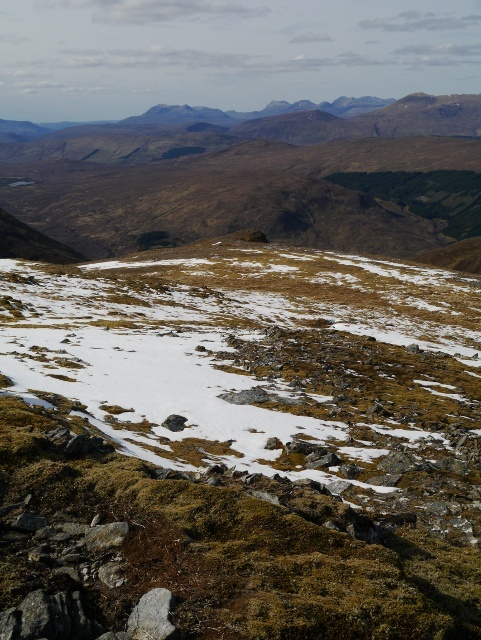 There was a huge patch of rock hard snow on a convex slope which we had to climb back up to get around. A slip on that would have sent us hurtling down the mountain. 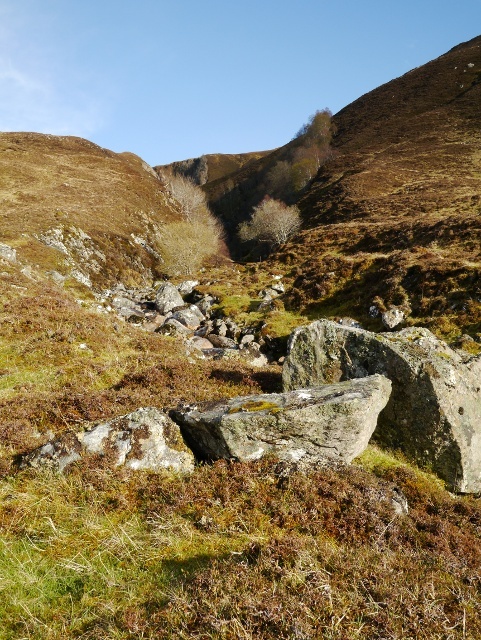 It was then a case of following a stream through peat hagged ground to the start of the gorge that the Allt Coire Dhughaill flows through. 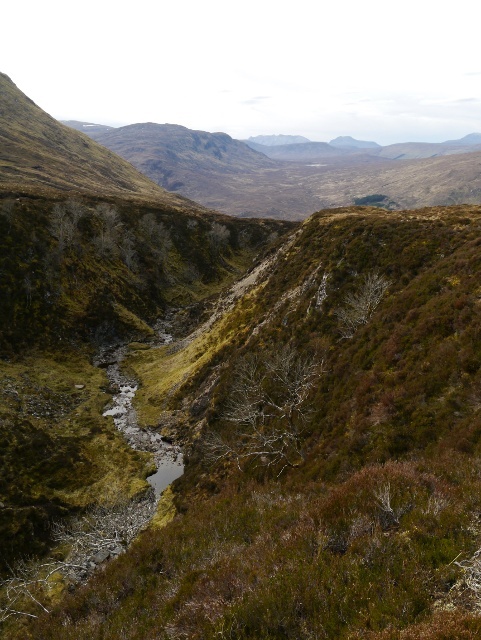 An old overgrown vehicle track then gave an easy rapid descent down to the floor of the glen. It was great to spot our cottage nestling on the other side of the river. I quickly began to look forward to lying in a hot bath before lounging in front of the fire. 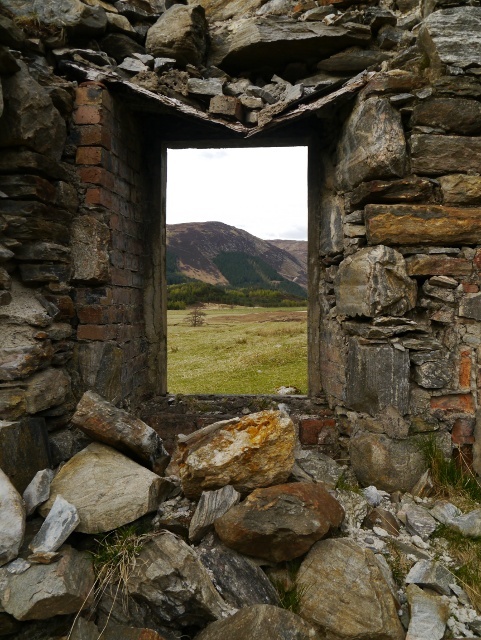 The ruins of Corriefeol were a sad sight, the roofs long gone and the elements slowly taking their toll. I spent a while exploring before crossing the bridge over the river Meig and walking the track towards our ‘home’ for the week. 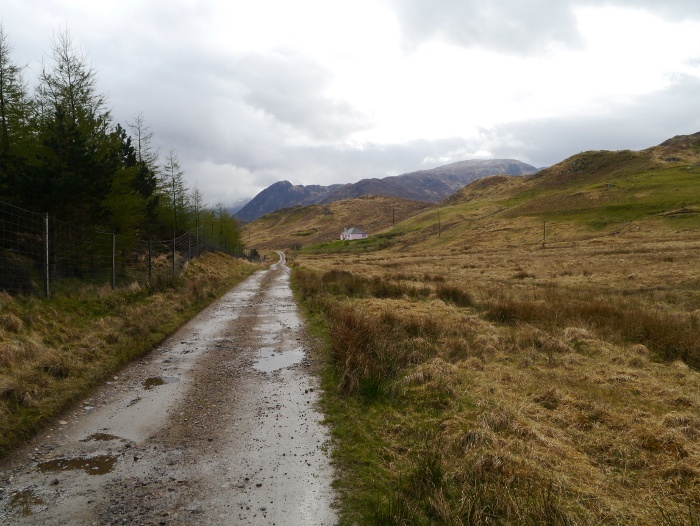 The single track road twisted through the narrow glen, mountains towering above on either side. A final turn and Loch Beannacharain came into view at the precise moment that Explosions in the sky had risen to its final crescendo on the stereo. It was one of life’s moments of perfect timing that put a huge grin on my face. 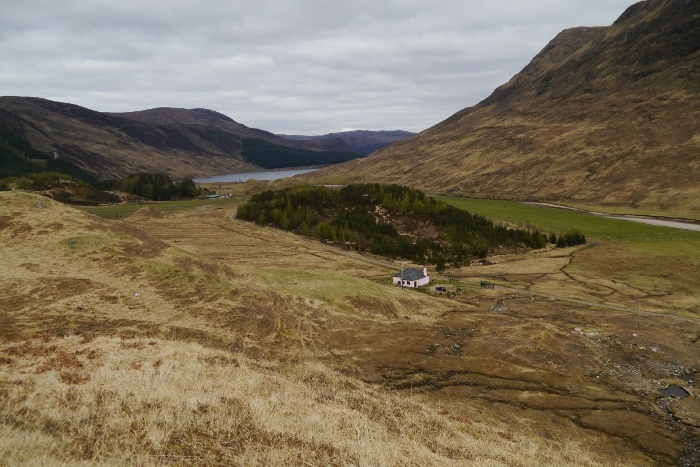 I had enjoyed a fantastic day on the hills lower down the glen and I was returning to our remote retreat in the furthest reaches of this scenic area. 18 miles at the end of a single track lane I passed the ‘No unauthorised vehicles’ sign and carried on down towards Scardroy lodge. 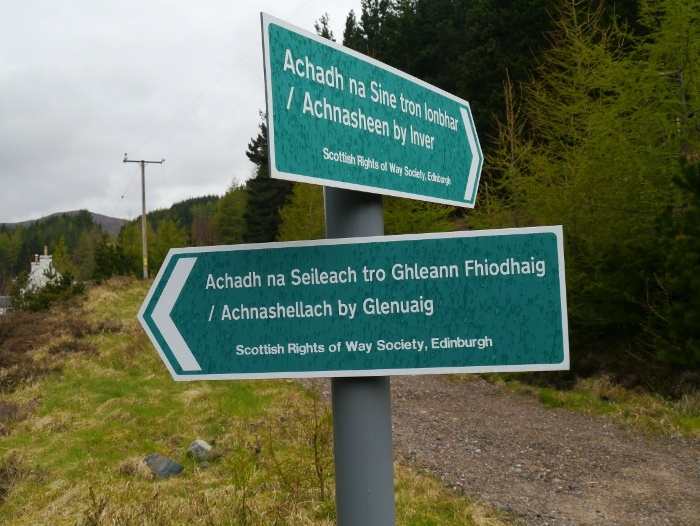 The sign by the Scottish rights of way society caught my eye as I passed by. Our cottage was on the track to Achnashellach, a very long walk to the west. 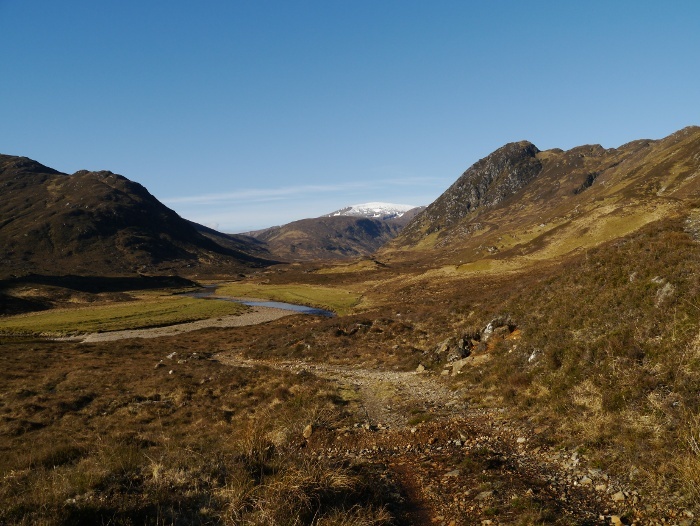 Keen backpackers could continue to the west coast at Attadale via the Bealach Bhearnais though wild uninhabited country. A mile and a half from the end of the public road was our cottage for the week, Braigh-na-Leitre. Always warm and inviting after descending from the hills with peat stained trousers and wet feet. I often felt privileged to be able to step out of the door and already be deep in the mountains. Out the back door and we were immediately on the hill. 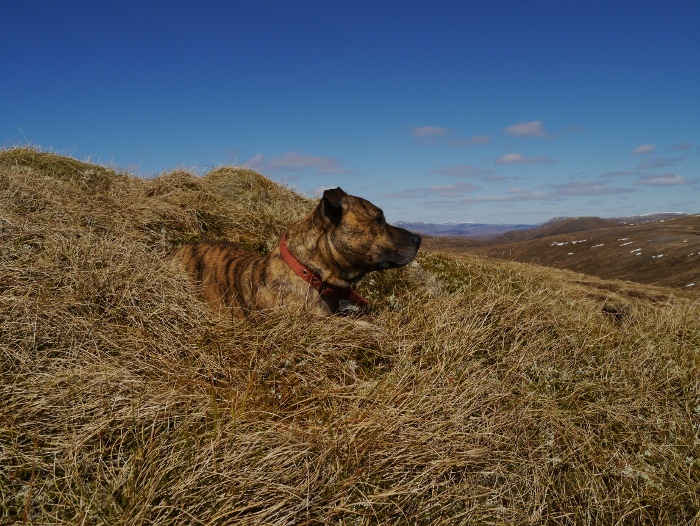 With hands in pockets and dog at my side I could amble with no real objective, enjoying just being in the hills. For me one of the joys of wild camping is sitting in my tent whilst eating and drinking, enjoying the moment and staring vacantly at the view. For a week the table in the conservatory was my tent porch and meal times were mesmerising with the changing light on the hill across the glen. Most evenings great herds of deer would descend to the river. This probably accounts for the rather numerous deer ticks in the vicinity! Anyway, as there is a risk of this becoming a ‘What I did on my holiday’ post I will stop typing and leave you with a few photos of the surroundings within a couple of minutes walk of the front door. 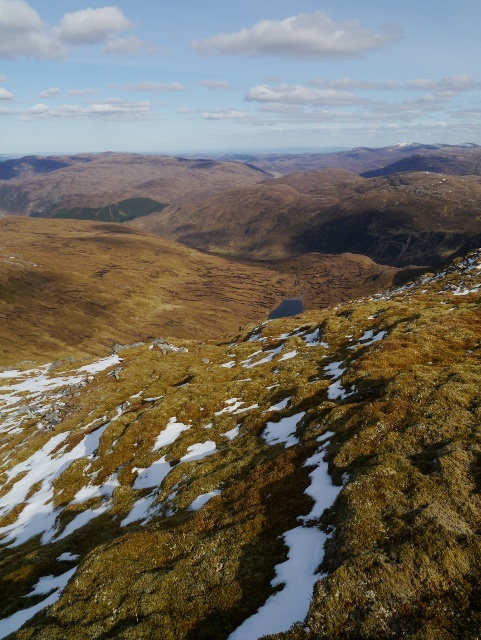 I did manage some memorable days on the hills with four Corbetts and two Grahams climbed. I will write my usual trip reports on them soon. 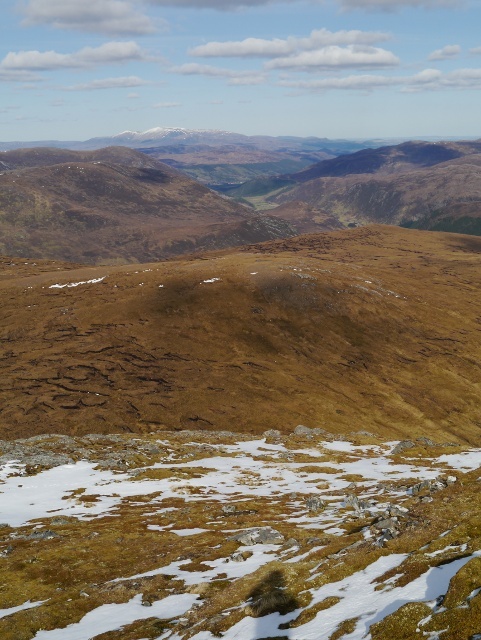 As I reached the summit ridge my jaw dropped, the whole of the Northern Highlands were laid out in front of me. 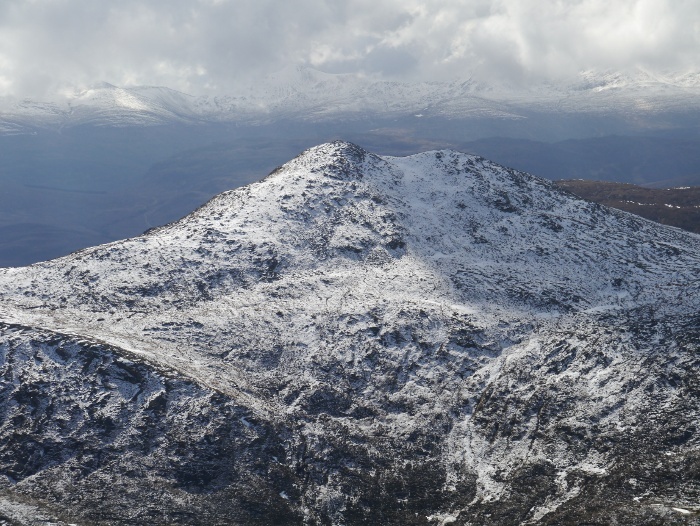 To the east was the snowy bulk of Ben Wyvis, then the Fannichs with its rollercoaster ridges. 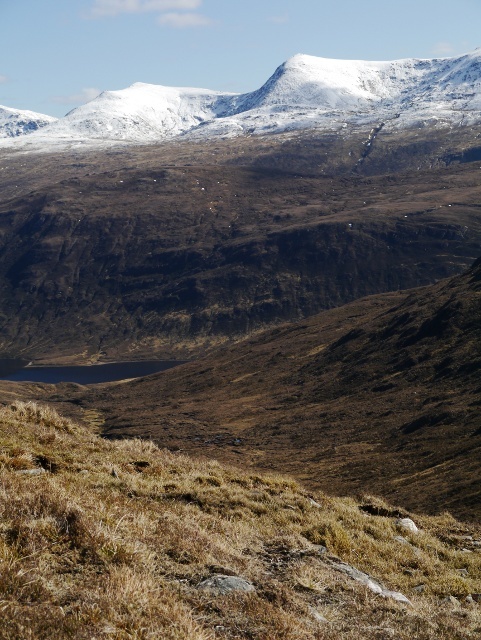 Far to the north-west I could make out the Fisherfield hills, the rocky bastion of Slioch being an impressive sight. Liathach in Torridon blocked out any further views to the west. However seeing Ben Wyvis and Liathach with one turn of the head is not bad going. I turned to the south and gazed out towards the Strathfarrar Munros but my attention was caught by Meallan nan Uan. Steep and rocky and plastered with snow it was blocking the way back to the car. 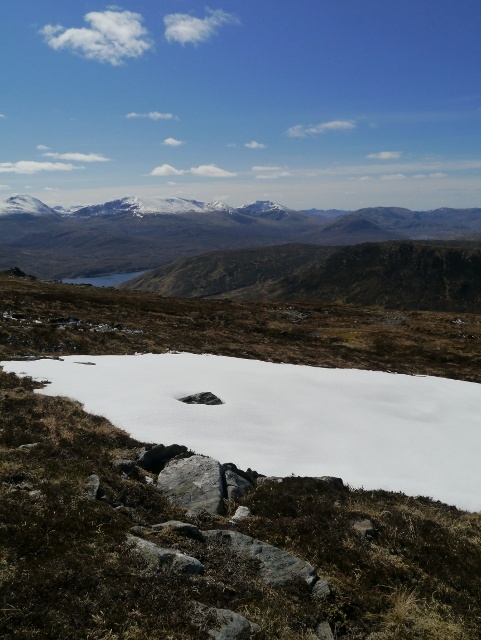 My mind started to drift to my ice axe and crampons which were not in my rucksack……. I do love a good Ordnance Survey map, some of them are things of beauty. 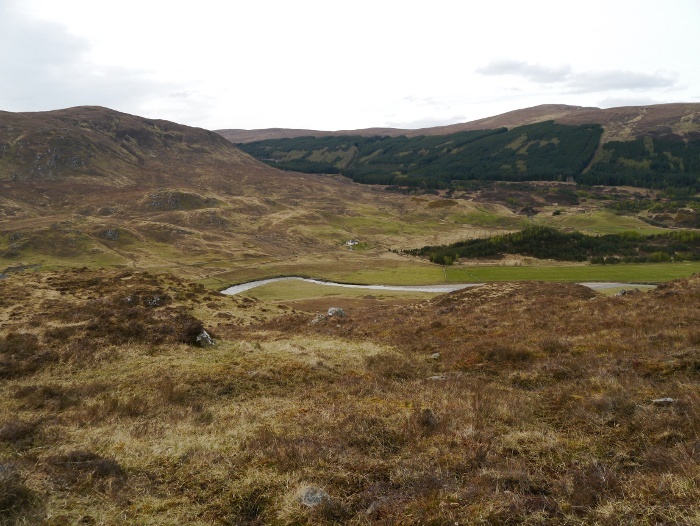 My favourites are those that show extensive areas of wild land, untroubled by intrusions such as roads. 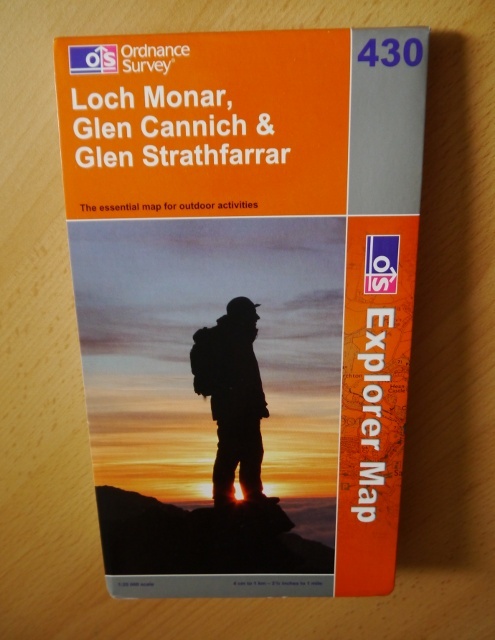 One such map is Explorer 430 which is full of bunched together squiggly contour lines, unbridged rivers and a splattering of lochs and lochans. 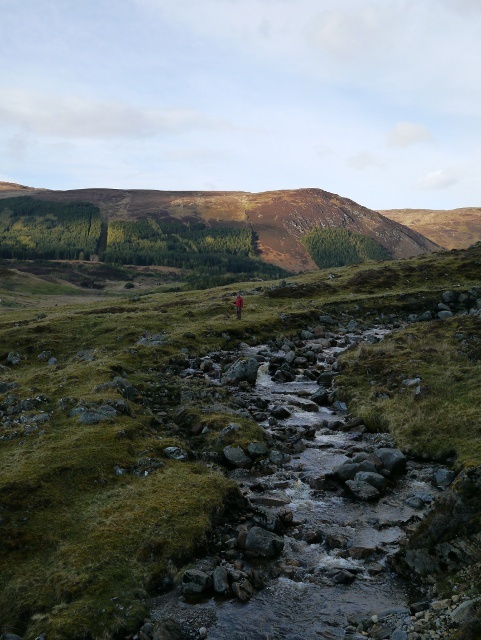 There is a paucity of roads, with the A890 upsetting the top corner of the map and a couple of dead-end single track roads teasing their way into the glens. I hope to get to know part of Explorer 430 very well over the coming week. I officially become an adult on Tuesday and turn 40. 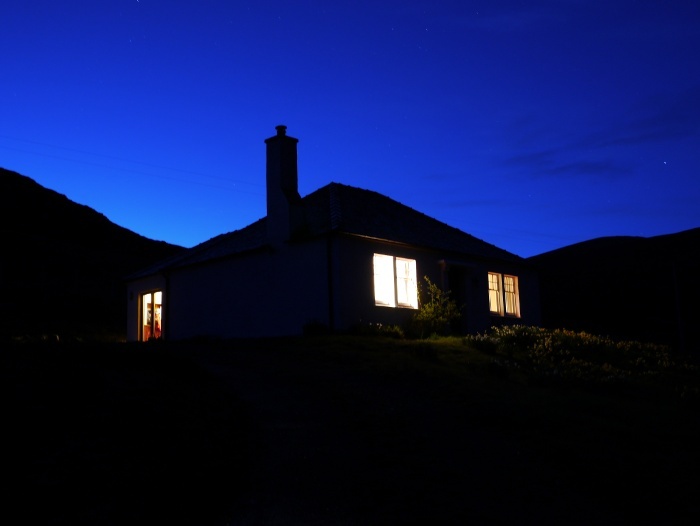 To celebrate I am retreating to a cottage in the Highlands with Corrina and Reuben. Can’t wait to get up there. Five whole days off in a row and I have not taken myself to the hills at all this weekend. A Bank holiday combined with rain usually assures misery in the hilly parts of the UK so I decided to stay at home. 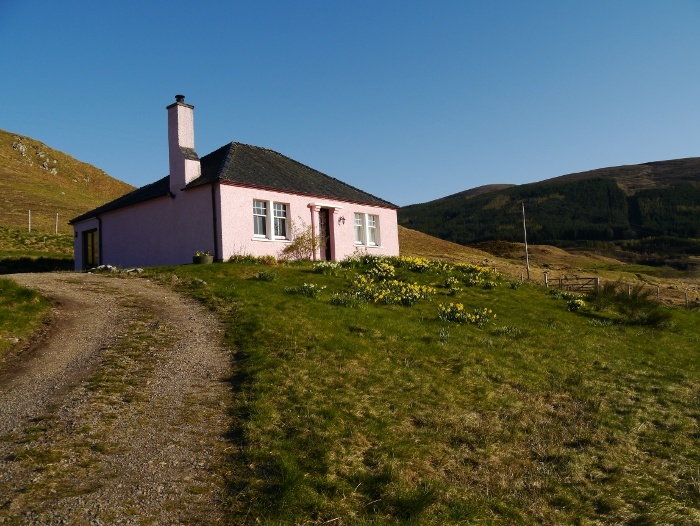 Anyway, a trip this weekend would be super self-indulgent when we will be in a remote spot in the Highland this time next week. Some luxury to celebrate a milestone birthday. Therefore I have just done a bit of tidying up of the ‘Trip reports – day walks‘ page this afternoon. There are 67 individual walks on there now and they have been grouped into areas. The Peak District features pretty heavily with 26 walks. I hope that someone finds them handy for when planning a walk. 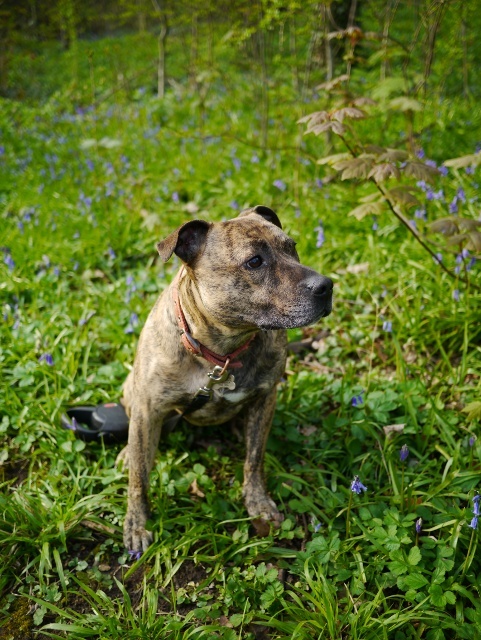 Time now to take Reuben for a walk though our local woods. We are lucky that although we only live a mile from the city centre, we have a nature reserve a 5 minute walk from the front door. There are a myriad of paths running through the woods and some excellent viewpoints over the city. 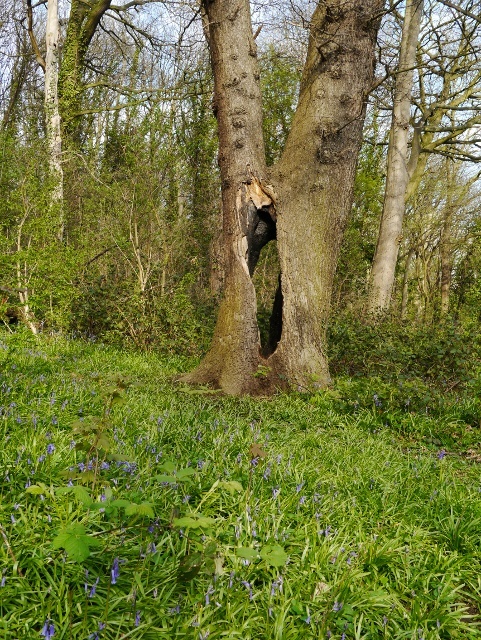 A couple of days ago I took a slightly different route than usual and came across a glade full of bluebells. Sometimes you don’t have to travel very far for a tiny taste of wild places.